Central Montana is composed of three counties: Fergus, Judith Basin, and Petroleum. These counties are very well know for its farm, ranch and recreation opportunities. Located in the northern part of central Montana is the Missouri River and Fort Peck recreation area noted for all types of hunting and fishing recreation. Central Montana also has the Snowy Mountains, Judith Mountains, and Moccasin Mountains. Lewistown lies within the center of these counties, with a population of only 6,500 residences, it is known for its local gathering spots, year round festivals, and recreational life. Lewistown is 130 miles from Billings and the Ranch is less than 100 miles from Great Falls, both have service from major airlines. The local airport has a 100 x 6100 foot runway recently resurfaced for private aircraft of all sizes. The beauty and quality of life in central Montana area is unsurpassed. 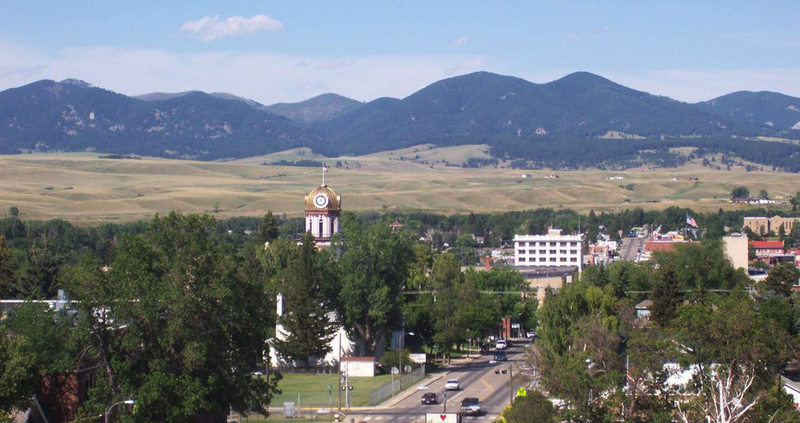 We invite you to explore the Central Montana small town living in the middle of a wildlife mecca. Central Montana has a wide variety of outdoor recreation. Main water features of Lewistown Area include Crystal Lake, Judith River, Missouri River, Big Spring Creek, Warm Spring Creek, and Ft. Peck Lake. Fishing in Lewistown often revolves around Big Spring Creek, home to blue ribbon Brown and Rainbow Trout. This wade and walking stream can be fished year round, along with stream fishing Lewistown also has a variety of reservoirs and ponds. Recently, Lewistown was noted as “a galaxy of hunting destinations” by Outdoor Life. The five mountain ranges surrounding the town include: Big Snowy, Little Snowy, North Moccasin, South Moccasin, and Judith Mountains, within these mountains are an endless variety of recreation opportunities. For instance the available hunting possibilities include: Elk, Whitetail Deer, Mule Deer, Antelope, Bear, Lion, and Turkey. The surrounding foothills and prairie landscape is also popular for native upland bird species such as: Mountain Grouse, Prairie Grouse, Hungarian Partridge, and Pheasants. Hunting access is available from the Bureau of Land Management, State Lands, Fish Wildlife Parks improvement areas, guided hunts, block management, and local landowners. Pheasants Forever named Lewistown the 5th Best Pheasant Hunting Towns in America! Number 5. Lewistown, Montana. This agriculture community is located in the geographic center of Montana, where pheasants can be found with buttes and mountain ranges as beautiful backdrops. Travel northwest to hunt the Pheasants Forever Coffee Creek Block Management Area, one of the largest habitat projects in Pheasants Forever’s history. – Anthony Hauck, Pheasants Forever’s Online Editor. Email Anthony at AHauck@pheasantsforever.org and follow him on Twitter @AnthonyHauckPF.